In a time of conflict around the world, it was heartening to see so much love and community support this weekend for Lorraine DiAnne Shihan at Valley Aikido. Kristina Varjan Shihan, Barbara Britton Shihan and Gina Zarrilli Sensei all spoke in support of victims of terrorism and the power of sincere practice to bridge divides. On the packed mat Saturday at Valley Aikido were Aikidoka from across the region and from multiple Aikido organizations. Guest of honor Lorraine DiAnne Shihan held court near the mat and at the party afterward, telling tales of Japan and her many encounters with the foundational teachers of American Aikido. Thanks to the hard work of Julia Freedgood Sensei and the wonderful members of Valley Aikido, the event was a financial success. Birankai dojos represented were Bucks County Aikido, Connecticut Aikikai, Fire Horse Aikido, Green River Aikido and Long Mountain Aikido, along with Birankai friend Needham/Newton Aikido Club. Great to see everyone and thanks for your support of this great event! We were incredibly lucky at Fire Horse Aikido to have Lorraine Dianne Shihan teach at our opening in 2010, as seen in the video above. Dianne Shihan’s powerful t echnique and loyal students have been an inspiration to me since I first began my serious Aikido study. 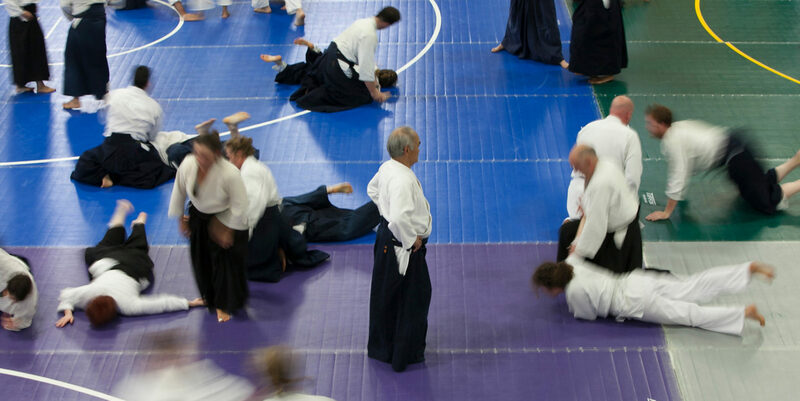 Now we have a chance this coming weekend to pay tribute to this pioneering Aikido practitioner in Northampton, Mass., at a special seminar with three top instructors. Kristina Varjan Shihan, Barbara Britton Shihan and Gina Zarrilli Shidoin will bring their dynamic, diverse styles to the mat at Valley Aikido, thanks to the organization skills of Julia Freegood Sensei. Below is some video to get you motivated to board planes, trains and automobiles to make it to this special, historic event! 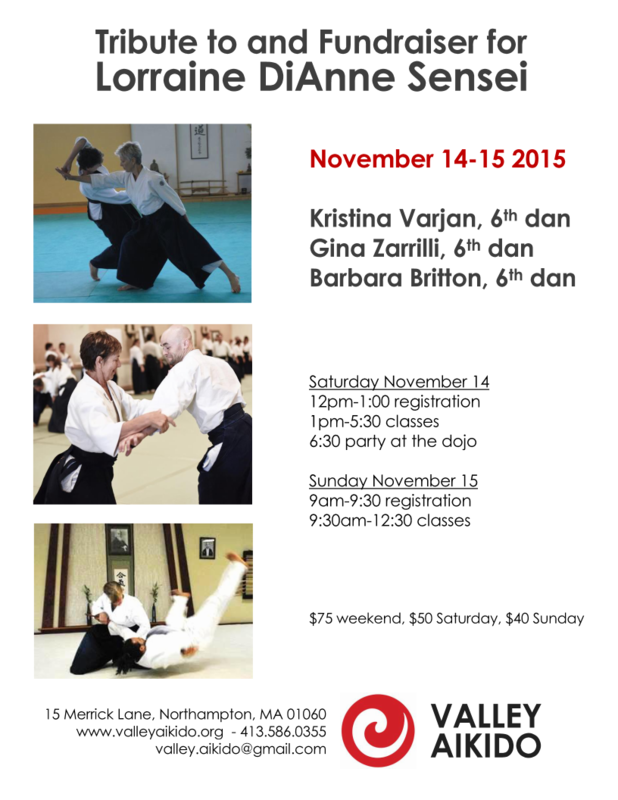 Frank Apodaca Sensei taught a weekend seminar at Multnomah Aikikai in Portland, Ore., October 23-25, 2015. It’s been a week since the Apodoca Sensei seminar was held here at Multnomah Aikikai, and I am still overwhelmed with this event. I don’t know if it was the massive numbers of aikidoka that showed up, the instructors from across Oregon and the Pacific Northwest, or the laser-sharp focus of Sensei Apodoca’s classes. I met and trained with old friends, made new ones, and got to train with some of our newest members of Multnomah Aikikai. I was proud of the hospitality and spirit I feel is representative of our school. And I think it was noticed by visitors who came from across town and from across the region. This event was a particularly poignant marker for two reasons. Sensei Apodoca has been training for 30 years now, and it’s been 15 years since he was chief instructor (his first teaching residency) at Multnomah Aikikai. Students and instructors were excited to welcome him back. A huge amount of information was presented over the course of the three days. It’s amazing how logically Sensei Apodoca can break down techniques in Aikido down into the most basic components. If we couldn’t understand hips and how to successfully apply them with our techniques at the end of seminar, maybe we weren’t paying attention. Apodoca Sensei said his mission was to challenge our assumptions and to get us to think about the fundamentals in a different way. Brute strength and muscle are no substitute for proper mechanics and martial efficiency. And in Aikido that means utilizing the hips. He also talked about the concept of “no attachment.” Without a preconceived idea of how an encounter will or should go, you can be free in the moment, and open to possibilities. I believe this idea in particular serves us well both on and off the mat. The weapons classes focused on getting off the line and the need to be light and swift on your feet while utilizing your hips to drive the bokken or jo. I sometimes get lost concentrating on my upper body (OK, well most of the time) while completely forgetting to control my lower body, specifically the hips and legs. Sensei’s weapons classes helped me, especially on the third day of the seminar as we progressed to more dynamic body art exercises. Apodaca Sensei showed us a lot of demonstrations of how you can work through your tension by slowing down and being mindful of how we are engaging our bodies. For instance, his demonstration of ushiro ryotedori ikkyo, where he highlighted the issues of over-reaching for elbow control vs. using the hips to effortlessly engage the desired point of contact. The entire weekend seminar was full of nonstop action, fun and practical tips on how we can enhance our techniques and adjust our approach to practice so as to harvest the most benefits. Excellent training at this seminar event! The work was simple enough that all could participate, but also deep enough to offer training insights and remedies to bad habits. In addition, our very own Jon Paul Oliva tested over a two-day period in both body arts and weapons and passed his fukushidoin certification test! I think I see a party in the future! Thanks to Senseis Fleshler and Van Amburgh for inviting Apodaca Sensei and thanks to all the teachers and students who came from all over the Pacific Northwest to support this event. Editor’s note: Thanks to Sam Brimhall of Multnomah Aikikai for the great video footage! Group photo from Apodaca Sensei seminar at Multnomah Aikikai, October 2015.